Operational Guidance for Migratory Birds and Vegetation Management for Existing Transportation Facilities and Infrastructure provides measures to conserve migratory birds and their nests during common vegetation management activities necessary for maintaining sight lines, removing hazards, or similar activities, such as pruning or removing woody vegetation, and mowing during the General Nesting Period of migratory birds. It provides guidance to minimize the risk of non-compliance with the Migratory Birds Convention Act and associated Migratory Bird Regulations. The guidance provided is intended to be non-prescriptive and allows for the flexible application of principles for a variety of contexts. This is part of a series of documents which are intended to be used alone or in conjunction with each other. It is recommended that practitioners have an understanding of the principles outlined in Beneficial Practices for Compliance with the Migratory Birds Convention Act and Regulations (2018) before applying any guidance proposed. PKG-MBBPOG-E (PACKAGE): PTM-BPCMB-E, PTM-MBVM-E and PTM-MBNBC-E: $175 member / $225 non-member. Available in print or ebook. PTM-BPCMB-E: Beneficial Practices for Compliance with the Migratory Birds Convention Act and Regulations: $129 member / $169 non-member. Available in print or ebook. 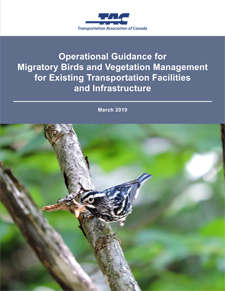 PTM-MBVM-E: Operational Guidance for Migratory Birds and Vegetation Management for Existing Transportation Facilities and Infrastructure: $45 member / $65 non-member. Available in print or ebook. PTM-MBNBC-E: Operational Guidance for Migratory Bird Nests under Bridges and in Culverts: $45 member / $65 non-member. Available in print or ebook. Background: Environment and Climate Change Canada (ECCC), through the Canadian Wildlife Service (CWS), administers the Migratory Birds Convention Act, 1994 and associated Migratory Bird Regulations to protect and conserve the vast majority of birds encountered in Canada. Migratory birds are frequently identified and encountered along transportation rights-of-way within natural habitats, as well as on culverts, bridges and other human-made structures. The presence of migratory birds can significantly delay a project or routine maintenance operation if it has not been accounted for during the project’s planning and design phase.